Ko Olina is located on Oahu's sunny southwest shore known for its beautiful white-sand beaches and exceptional golf courses. With close access to great dining and shopping as well as activities and entertainment, a Ko Olina condo provides everything you need for the relaxing and luxurious Hawaii vacation of your dreams. A range of activity options are offered in the Ko Olina area and along Oahu's southern shore including championship golf courses, luxurious spas and great beaches and for relaxation and water activities. Golfers enjoy the multi-tiered greens and immaculate grooming of the Ko Olina Golf Course which also has nice ocean views. Humpback whales can be seen passing by offshore during the winter months and you can get a closer look on a whale watching tour. Just a short drive away are many historic attractions including Pearl Harbor and the USS Arizona Memorial with a new Visitor Center to learn about this important site. There are also some great hikes in Honolulu including Diamond Head Crater, Manoa Falls and the Makapuu Lighthouse trails. From Ko Olina Marina you can embark on snorkeling and diving cruises, fishing charters, sunset cruises and other ocean excursions including whale watching tours during the winter months. The lovely Ko Olina ocean lagoons provide protection from the open sea due to seawalls that create a calm and shallow area where children can play. The lagoons are lined with fine, imported white sand from the island of Lanai and also a grass lawn making this area a pleasant spot to enjoy the day. The beach coves are part of Ko Olina Beach Park within the Ko Olina Resort. Head east from Ko Olina to enjoy Ala Moana Beach Park, the iconic Waikiki Beach and exceptional snorkeling at Hanauma Bay. Drive north from Ko Olina to visit Makaha Beach which is famous among surfers for its big winter waves. Dine and enjoy live entertainment at the Marriott Ko Olina including ocean view seating poolside at Naupaka Terrace. More exceptional dining can be found at the nearby Disney Aulani Resort. At the Ko Olina Golf Club is Roy's Restaurant featuring the Hawaii Regional Cuisine of renowned chef Roy Yamaguchi. Take a drive over to Kapolei or downtown Honolulu for an exceptional range of great dining choices. 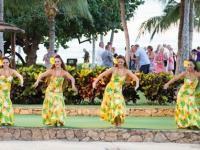 In Waikiki dine along the shore while taking in the views and listening to live entertainment. Aloha Tower Marketplace at Honolulu Harbor is another great place to enjoy a meal and live music. You'll find a diversity of cuisines in this area with something for every taste and budget. The Ko Olina region is rich in shopping opportunities with local convenience stores and groceries as well as boutique gift shops at the resorts, and also Kapolei town close by where you will find an abundance of stores of all types. Also not far from Ko Olina is the huge Ala Moana Shopping Center, the largest in the islands. An interesting range of shops can be found in downtown Honolulu including the eclectic Chinatown district. In Waikiki browse the many shops along Kuhio Ave. and Kalakaua Avenues for everything from top designer fashions and fine jewelry to unique hand-crafted Hawaii souvenirs. A rental car is recommended when staying in a Ko Olina condo so you have easy access to nearby beaches, downtown Honolulu and Waikiki as well as day trips to see the beautiful north shore beaches and the windward side. Most of Oahu's major communities can also be reached on the island's public transit system known as "TheBus." Ko Olina weather is typically very pleasant all year around with many sunny days, balmy trade winds and temperatures ranging from about 70 to 87 degrees F. throughout the year. Rain and wind conditions vary in different areas throughout Oahu with the south and west shores generally a bit dryer and warmer than the north and eastern shores, and winter months seeing more rain than summer. Ocean conditions can vary each day though the south shore of Oahu is typically quite calm with some south swells during the summer that can bring high surf and strong currents, and large north swells mainly affecting the north shores during the winter months. Visit lifeguarded beaches and check with water safety officials about the safest areas for the ocean activities you choose. Ko Olina condos provide the ideal way to enjoy your Oahu vacation with the luxuries of resort living and the comforts of home. Browse through our Ko Olina condo listings to get an understanding of the different amenities and property features we offer. Our goal at Hawaiian Beach Rentals is to provide you with a with an unforgettable Ko Olina accommodation for your dream vacation. We take pride in having the largest selection of high-quality condos on Oahu and we stand behind our product, making sure only the best Ko Olina properties are listed on our site. If you have questions about our Ko Olina condos or which Hawaii destination is best for your vacation needs, please give us a call and we will be happy to assist you. See below for an overview of some of Ko Olina's finest condo resorts. During the era of the Hawaiian monarchy the Ko Olina region was a favorite place for Hawaiian royalty who came to enjoy the protected ocean areas. Among these regal visitors were the famed King Kamehameha I, his powerful wife Queen Kaahumanu, and later Queen Liliuokalani. During World War II this region served as a recreation area for the US navy and army. Ko Olina began to be developed as a world class visitor destination in the 1980s and this resort development continues today. To explore the rich history of Oahu's south shore you can visit numerous historic sites in downtown Honolulu including preserved buildings and also several notable statues. The Bishop Museum in Honolulu is a treasure trove of ancient artifacts, and a self-guided Waikiki Historical Trail includes informational plaques placed on bronze surfboards at numerous south shore landmarks. Ko Olina Beach Villas Resort is located on 642 acres within the prestigious Ko Olina Resort and offers spacious villas suites with state-of-the-art kitchens. Amenities include large, private lanais, gated grounds, lagoon-style pool, three jet spas, private fitness spa with high-quality exercise equipment, sauna and steam room, outdoor lap pool, exclusive beach bar, free WiFi, barbecue grills, picnic areas, door staff, security guard and beachfront access to the pristine ocean lagoons for water activities. Ko Olina Beach Club is a family beach resort with a private, child-friendly lagoon and beach oasis in a 642-acre gated community. Spacious one, two and three bedroom villas have fully-equipped kitchens, washer/dryer, high-speed internet, TVs and more. Amenities include on-site spa, three swimming pools, seven whirlpool spas and lush landscaping with waterfalls and fountains. 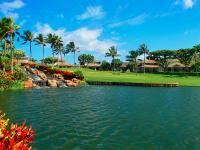 Close to Ko Olina Golf Club. Outrigger Regency on Beachwalk offers boutique one and two-bedroom condos with a contemporary elegance. Condos have gourmet kitchens with refrigerators, microwaves, dishwashers, ceramic stovetops, cookware and tableware. Rooms also have a flat screen television, free high-speed internet and a balcony to relax in the tropical breezes. Other amenities include air conditioning and an in-room safe. Located next to the popular Waikiki Beach Walk with lots of great shops and dining options. Aston Waikiki Beach Tower is across the street from Waikiki Beach. Condos have gourmet kitchens, private lanais, air conditioning and washer/dryers. The building has a fitness room and also a recreation deck with a jet spa and pool. Close by is the International Market Place and also the Royal Hawaiian Center with great shopping and dining. Also close by is Kapiolani Park as well as Waikiki Aquarium. Outrigger Waikiki Shore on Waikiki Beach offering spacious, apartment-style accommodations, many with great ocean views. Studios have a kitchenette and suites have a full kitchen All units have a washer/dryer and free WiFi. Close to the Waikiki Beach Walk with an abundance of shops and restaurants. Guests have access to the pool and fitness center next door at the Outrigger Reef on the Beach hotel which has two restaurants and nightly Hawaiian-style entertainment. Waikiki Banyan is close to restaurants, shop and attractions, with amenities including on-site management, upscale lobby, recreation deck, swimming pool, lounge chairs, two hot tubs, a sauna, play equipment, tennis and basketball courts, a putting green, grills for barbecuing, on-site coin laundry and a small restaurant. Royal Waikiki Condos on the Waikiki shore has an outdoor pool as well as a fitness center and sauna, barbecue grills and an arcade/game room. Rooms have kitchens with refrigerators, microwaves, cookware, dishes and utensils. Daily housekeeping is offered. Condos open to balconies. Also nearby is the Ala Wai Golf Course, Kapiolani Park and the Waikiki Aquarium. Aston Waikiki Sunset is about one block from Waikiki Beach, offering suites with complete kitchens as well as private lanais and one or two bedrooms. Great views of Honolulu, the ocean or Diamond Head. Swimming pool, free WiFi and a business office with Internet access. The Wyndham at Waikiki Beach Walk offers many amenities including a lounge, fitness center, bar, free high-speed internet (WiFi), a restaurant and a pool. Condos have kitchenettes. Close to shops, restaurants and the beach. Please browse through the Hawaiian Beach Rentals condo listings in the Olina Resort area at Ko Olina Beach Villas Resort including the Beach Tower and Ocean Tower.